EDWARD LEE - BUKIT GASING: . :Gasing Hill development:. Development on Gasing Hill is by Sanctuary Ridge. Stop-work order received by DBKL!
. :Malay Mail - 14 April 2008:.
.:Malay Mail - 15 April 2008:.
.:23 April 2008 : KL High Court:. Part of the trail at Taman Pendidikan Bukit Gasing has collapsed in a big way due to a landslide sometime last week. The trail has been cut off. A bungalow's compound is under threat. Although unrelated to the proposed development on the KL side, this is natural evidence of how fragile Bukit Gasing is. Please join us to SAVE BUKIT GASING. 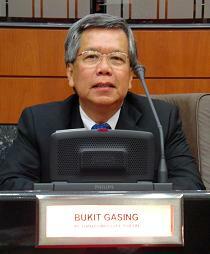 the effort to save bukit gasing is a noble and noteworthy one. i was formerly a resident here and have fond memories of the hill. now i am a consultant and work with developers. i guess i do see the other side of the coin but lets examine the issues here as objectively as possible. firstly, is the area a gazetted green belt ? secondly, is the sanctuary meridian or ridge, i get confused, development in the gazetted area ? thirdlly, is it privately owned land ? fourthly, is the development infringing zoning and density controls ? lastly, are private land owners allowed to hoard their properties against trespassers ? much as i support the effort to save bukit gasing, i am troubled by the bias against any development per se attitude. whilst it would be great to save a green hill, the rights of the landowner must also be looked at. my research indicates that the land is privately owned and falls outside of the area gazetted as FT land. although certain parties have raised doubts about whether it was legally alienated in the past, these allegations remain in the past and are not related to the present party as the land has changed hands before.The development is also within the zoning and density controls.private land owners should have the right to hoard their land. this does not bode well for the effort to save gasing hill but it does shed light on what can and should be done. firstly, move to gazette the FT portion as a green belt by lobbying the governtment for it. secondly, offer to acquire the sanctuary land for purpose of gazetting it as a green belt. this may be a fairer solution and a long term one. it would not be right to ask individual land owners to give up their property for the good of the public at no compensation and stop them from doing anything on it simply because we do not like it. this would be unfair and wrong. none of us would tolerate our neighbours asking us to give up our garden just because their children like to play in it ? so why should the sanctuary landowner be asked to do likewise ? i know i run the risk of becoming unpopular but the points i raised needs to be mulled upon in the interests of justice. the rights of the one is also equal to the rights of the many. i was disheartened to hear your legal counsels advising that the land owner did not have approval to put up hoarding and making issue about this. whilst it is true that council or cityhall approvals must be obtained, this is usually simple formality. it is akin to trying to make issue about putting up a fence around our own house/garden.it is not fair to protest about your neighbours fence when you have one yourself. legal counsels are sometimes clouded by conflicts of interests too. in the endeavour to fight for people's rights, let us not forget that the landowners and developers are people too. it may appear popular at the moment to trample anything approved by the previous government but it may not be right and we may end up trampling upon the very people we claim to defend in the end. let us be clear. the people have a right to object with development in govt land gazetted for green lungs and otherwise. the people have a right to object against development which are against zoning and density controls. the people have NO RIGHT to deprive or even attempt to thwart the landowners' right to develop their properties. i would be happy to correspond with you on the subject of bkt gasing but before doing so i would be grateful if you could identify yourself and let me have your contact details. your details won't be published on the web though, unless you give consent. Still haven't heard from you.